The novel’s hero, Peter Uldanov, is the son of Stalenin, the dictator of Wonworld—a socialist dystopia that, in the year 2100 (282 A.M.– After Marx) spans the entire globe. Peter, raised away from politics by his mother, has not been indoctrinated into Wonworld’s ideology of totalitarian central planning of all aspects of its citizens’ lives. While completely new to politics, Peter is highly intelligent and an accomplished pianist and mathematician. Stalenin is dying and, out of paternal affection, seeks to engineer Peter’s succession. Peter is intellectually honest and is perplexed at the widespread poverty, famines, and shortages of Wonworld, as well as the constant climate of terror in which its subjects live—even though the regime claims to have “liberated” them from oppression by the capitalists of old. Peter attempts to introduce a series of reforms to allow criticism of the government and free elections, but his goal of achieving human liberation fails to take hold so long as the economy remains completely centrally planned. Peter’s nemesis is Stalenin’s second-in-command Bolshekov, who zealously defends the system of command and control while he is the main agent of torture, execution, and mismanagement within it. Peter enlists the assistance of Thomas Jefferson Adams—the third-highest official in Wonworld. Adams is disillusioned with the socialist system and gropes for alternatives but, like Peter, does not have the benefit of the lessons of history—since any works of literature, economics, philosophy, and political theory that disagreed with Marxism-Leninism were purged after Wonworld’s establishment a century earlier. Adams has become cynical by observing decades of attempted “reforms” within Wonworld, which tinkered with specific policies and plans but never challenged the overarching fact of total central planning. Peter, as an outsider with a fresh perspective, is more willing to overhaul the system’s most fundamental features. In the genuine search for greater prosperity and more humane treatment for Wonworld’s population, he begins to dismantle the socialist system piece by piece, at first without even recognizing that this is the effect of his actions. 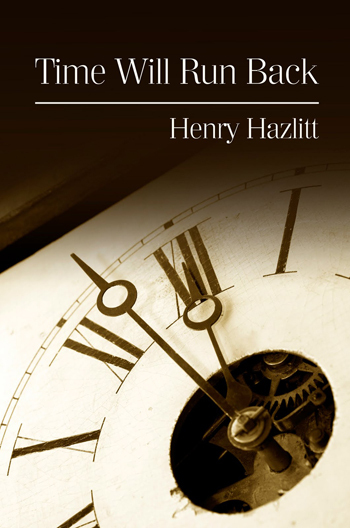 Hazlitt frequently emphasizes the connection between the economic empowerment that freedom in business offers and the resulting surge in the quality of life and daily experience—a sense of responsibility, opportunity, self-direction, and the ability to chart one’s own future that permeates an economy where individuals are their own economic masters. While under central planning, no progress occurs unless initiated by the exceptionally rare enlightened rulers at the top, in a free market every businessman and worker can be an agent of human progress. Peter observes that a free-market system is meritocratic and tends to reward contributions to human well-being: “Everyone tends to be rewarded by the consumers to the extent that he has contributed to the needs of the consumers. In other words, free competition tends to give to labor what labor creates, to the owners of money and capital goods what their capital creates, and to enterprisers what their co-ordinating function creates” (Hazlitt 1966, 139). Adams responds that, to the extent a free-market system is able to achieve this, “no group would have the right to complain. You would have achieved an economic paradise” (Hazlitt 1966, 139). In a later discussion, Peter notes that the profits realized by businesspeople in a free-market system cannot be maintained on the whole except in a growing economy where consumers are increasingly better off; a free-market system cannot be called a profit system “in a declining or even in a stationary economy. It is, of course, a profit-seeking system” (Hazlitt 1966, 150), but the search for profit in a free economy will only succeed if human needs are fulfilled by the entrepreneur in the process. The intellectual honesty of Peter Uldanov enables him to transform the role of inadvertent world dictator to that of guardian of individual freedom. Freeworld overcomes Bolshekov’s Wonworld in a largely bloodless military campaign, due to Freeworld’s overwhelming superiority in production and the eagerness of Wonworld’s citizens to throw off Bolshekov’s totalitarian rule. At the novel’s end, Peter decides to hold free elections and subject his own position to the people’s approval. Running against the mixed-economy “Third Way” advocate Wang Ching-li, Peter narrowly wins the election and becomes the first President of Freeworld, even though his preference would be to devote his time to playing Mozart. Peter has the wisdom to unleash the productive forces of free enterprise and then to step aside, except in maintaining a system that punishes aggression, protects private property, and provides a reliable rule of law. The ending of Time Will Run Back is a happy one, but it is made possible by one key tremendously fortunate and unlikely circumstance—the ability of a fundamentally decent person to find himself in a position of vast political power, whose use he deliberately restrains and channels toward liberalization instead of perpetuating the abuses of the old system. Peter is, in effect, a “philosopher-king” who reasons his way toward free-market capitalism, unleashing private business to bring about massive human progress. Without such an individual, Wonworld could have lingered in misery, stagnation, and even decline for centuries. In our world, however, where the vestiges of free enterprise and the history of economic thought are much stronger, we do not need to rediscover sound economic principles from whole cloth, so perhaps existing societies could eventually muddle through toward freer economies, even though no philosopher-kings are to be found. Hazlitt gave us Peter Uldanov’s story to enable us to understand which reforms and institutions can improve the human condition, and which can only degrade it. Reference: Hazlitt, Henry. [1966.] 2007. Time Will Run Back. New York: Arlington House. Ludwig von Mises Institute. Available at library.freecapitalists.org. Accessed December 13, 2014.